Preheat oven to 350° F. Place a heavy bottomed, ovenproof sauce pan over medium heat. Add the butter and oil and heat through. Stir in onions and bay leaves, and cook until onions are tender and translucent, about 5 minutes. Add rice and stir completely with hot fat. Do not allow the rice to brown. Pour in simmering chicken stock and season with salt. Bring to a boil. Cover pot tightly and place in the oven. 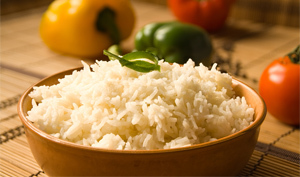 Bake until the liquid is absorbed and rice is fluffy and tender, about 20-25 minutes (or longer for brown rice). Transfer cooked rice to a serving dish and fluff rice with a fork. Remove and discard the bay leaves & serve immediately. Peas, carrots, salsa, asparagus, corn, broccoli, and many other vegetables can be added for a slight variation on the recipe. Coconut milk can also be substituted for chicken stock.